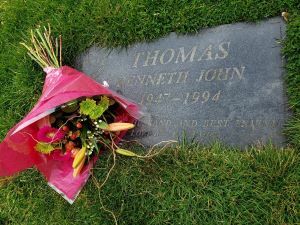 Today marks the 25'th Anniversary of the passing of our company Founder, John Thomas. John passed at 5:50 PM (PST) March 22, 1994 with beloved wife Betty at his side. Betty recalls that as she looked out into the sunshine, an eagle flew past the hospital window as he breathed his last breath. Since John's passing, Betty, with new husband John Quee, has built Thomas FX into a global special effects brand serving customers in 78 countries around the world. Wherever quality movies and Television Productions are being filmed, Thomas FX products are being used. John lies interred at Capilano Cemetery in West Vancouver, beside Betty's Mother Juliana Zombori. You are remembered well by all John . . . . . the Dream Lives On!